Left: no herbicide, Right: dicamba. Label requires livestock be removed from treated fields at least 30 days before slaughter. No waiting period between application and grazing for non-lactating animals. Don’t graze lactating dairy animals for 7 to 60 days after application, depending upon rate applied. Always read herbicide labels for restrictions. You may not want to put the sprayer away for winter just yet. Weeds can be a problem that reduce quality, quantity and stand life of our forages. 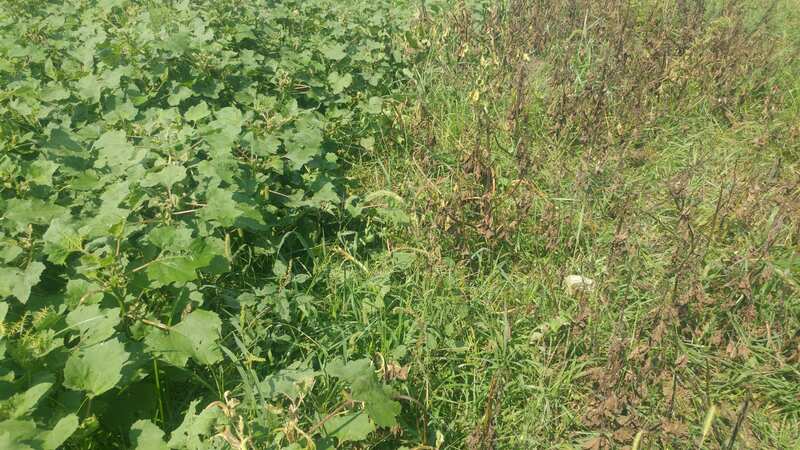 We generally think of battling weeds in the spring or early summer, as crops begin to grow, because we naturally want to reduce competition for our forage crops. However, the best time to control many winter annuals, biennials and cool season perennial weeds is mid/late-September through early November. Highly productive pastures and hay fields do not happen just by accident. Good grazing management, weed and pest control, nutrient management and properly timed harvests all have an important role. Weeds often reduce the palatability of forages and certain weed species are potentially poisonous to grazing livestock making plant identification even more important. Pasture and Forage Weed Control; Mow or Spray? It is important to remember that each herbicide varies in terms of target weed response. In other words, herbicides vary in ability to kill specific weeds and always refer to product labels prior to use. Always wear the personal protective equipment recommended on the product label. Be aware of product restrictions and recommendations relating to the environment, sensitive crops, and bees. To properly apply herbicides it is important to calibrate the sprayer and utilize the correct nozzle. When a label permits, utilizing surfactants may improve the effectiveness of herbicide application. Be aware of water quality issues that may affect herbicide performance and spray product soon after mixing since solution pH may change reducing formulation effectiveness. Forage Focus: Is it a Weed, or Wildflower? This month on the Forage Focus podcast, host Christine Gelley, an Extension Educator with The Ohio State University Agriculture & Natural Resources in Noble County, talks about Weeds versus Wildflowers. Beauty is in the eye of the beholder, and many have differing opinions on what is actually a “weed” and what is a “wildflower.” Christine shares examples pointing out differences between being weeds and wildflowers. Two weeks ago at Ag Progress Days I participated in a Management Intensive Grazing demonstration with USDA-NRCS Grazing and Soil Conservation Specialists. It rained much of Tuesday, after which it became sunny on Wednesday and was dry on Thursday. The soil of our grazing demo was an Andover poorly drained channery silt loam soil on an 8-15% slope. This soil has a shallow fragipan which is almost impervious to water, so it has a seasonally high water table. 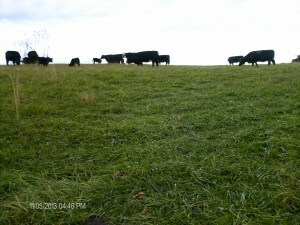 In fact, water was still standing in some pockets of the field while cattle were grazing. Half of our field was in a tall fescue/ orchardgrass sod that had been in place for many decades, while others were sod that had been terminated last year and planted in summer annuals for our demonstration. We managed this half as no-till. In early July of last year we planted a highly diverse mixture of summer annuals in this field (Iron and Clay Cowpeas, AS 6501 Sorghum Sudangrass, Daikon Radish, Wonderleaf Hybrid Pearl Millet, AS6401 Sorghum Sudangrass, Peredovik Sunflower and T-Raptor Hybrid Brassica), which was followed by a spring triticale/spring pea mix this spring that was terminated with glyphosate, after which we planted different summer grazing mixes in this field. FED CATTLE: Fed cattle traded $1 lower than last week on a live basis. Prices on a live basis were mainly $108 to $109 while dressed prices ranged from $170 to $174. The 5-area weighted average prices thru Thursday were $109.08 live, down $0.44 from last week and $172.82 dressed, down $0.34 from a week ago. A year ago prices were $106.78 live and $169.74 dressed. USDA released the Cattle on Feed and the Cold Storage reports last week. Let’s start with the Cattle on Feed. The headline number was that placements were up 7.8 percent compared to July of 2017. Most of that increase (83 percent) was in light weight feeders, those weighing less than 600 pounds and between 600 and 700 pounds. The increase in light weight feeders makes some sense given drought conditions across a broad swath of cattle country. That the increase was largely in light cattle probably makes some sense production wise, given that this is July placements. But, by placing these animals now, it does slightly reduce the supply of calves available later in the Fall. These placements will likely start to hit the market late in the year or very early in 2019. Don’t Forget to Rest Your Roots! Overgrazing in the fall reduces the plant’s rate of carbohydrate production, potentially reducing root regeneration before winter. Fall pasture management is a critical period for pastures. For many of us we have had adequate rainfall up until recently and pastures have done well to this point. As we transition into late summer and early fall it is critical to pay close attention to your forages. Some pastures may be stockpiled, but those intended to be grazed this fall still need time to rest. It’s very tempting to use those forages that green up late in the fall. 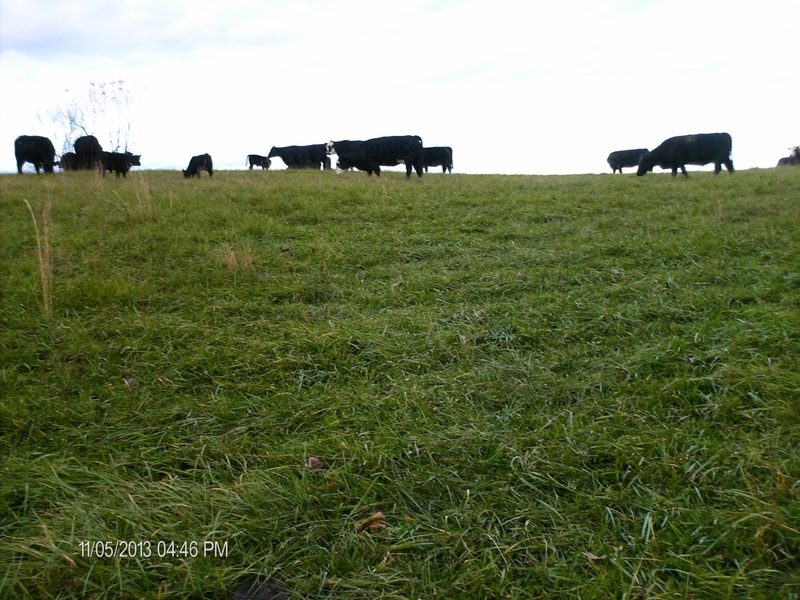 Management decisions made this fall will greatly impact forage growth next year. Similar to 2015, rain in the spring extending through early summer delayed hay harvest in many areas of the state. Additionally there were some high temperatures that caused an increase in the rate of maturity of forages before they could be harvested. For example alfalfa grown at 63°F may take 52 days to reach early bloom but only 21 days at 90°F. As forages mature, there is an increase in cell wall content and a decrease in the digestibility of the cell wall. So for some producers, all these factors came together to create the perfect storm that led to significantly lowered forage quality. 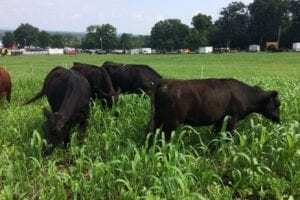 In 2015 a group of Extension Educators in Pike, Ross and Gallia counties worked with forty-seven livestock producers in obtaining hay samples for nutritional analysis that fall. There were a total of eighty-one hay samples collected. Suspecting we will see similar quality when this year’s forage sampling is done, the following are a subset of those 2015 samples with example diets to meet beef cow dietary requirements for late pregnancy and lactation. Oklahoma feeder cattle prices averaged nearly four percent above one year ago in the first week of August with calf prices increasing from the previous week. Feeder prices are holding strong despite continued growth in feeder cattle supplies. Combined Oklahoma feeder auction totals have averaged 13 percent higher year over year since early July. National data for feeder and stocker cattle sales in the month of July were seven percent over last year. The July Cattle report estimated the 2018 calf crop nearly two percent higher than 2017. Estimated feeder supplies on July 1 were 0.5 percent higher than one year ago. All indications are that fall feeder markets will feature a calf run larger than last year and abundant feeder supplies. Prices for feeder cattle typically decline seasonally for all weight classes after August. Calf and stockers up to 600 pounds (which peak in March) typically have a seasonal low price in October while heavier feeder cattle decline from an August peak lower through the end of the year. On average, feeder cattle prices decline four to five percent from August to lows in the fourth quarter. Large supplies, record exports, and trade concerns are just a few of the topics that have dominated the headlines in 2018. We are now fully transitioning into a primary calf selling time of the year for cow-calf producers and into an active buying time for stocker producers. I’m going to try to sum up a few of the more prominent factors affecting cattle markets and discuss how they could impact cattle prices this fall and beyond.